This FantasyDraft review will cover everything you need to know about playing at this medium sized DFS site through the eyes of a new NFL football player. I cover the basics of creating your account, finding a tournament, drafting your team and entering the contest. Plus I will of course make sure you lock in the absolute best FantasyDraft bonus and promo code along the way! 10 for 10 plan – Get 10% rakeback and 10 of anyone you refer. Editors Note: FantasyDraft.com is a great place to play in smaller contests against fewer competitors. The scoring system for NFL is the same as DraftKings so it makes drafting players easier for me since I already play at DK. The site is super easy to use and they have plenty of lower stakes games which I personally like to play in. They offer beginner and intermediate contests which keep the seasoned professionals away. I’m playing in those this NFL season. New to FantasyDraft? Claim your free $4 entree into a Guaranteed Winner Contest here and get started. There are contests running daily you can join. The sign up process is fairly simple. Name, email address, state. Just fill the info out and click the submit button. Once your account is created they drop you right on the deposit page. You can, but don’t have to deposit right now. You can click at the top of the screen to see the lobby and scroll through the games or create a lineup. It’s a clean, well organized and fairly straight forward lobby. There are multiple tabs at the top you can click that will filter the contests shown below. Since I’m new I want to take advantage of the beginner only contests where I can. I clicked ‘NFL’ and then ‘Beginner/INT’. This shows me the NFL contests that are beginner or intermediate only. This means I’m playing new guys and not against the FD regulars. You can click on a contest name to bring up all the details including prize payouts, rules, games and decide to enter it or not. Once you click enter you are taken to where you draft your players. Get 10% of your rake back and 10% of anyone you refer. Games are salary cap based. In NFL you have 100k to spend to build your team. 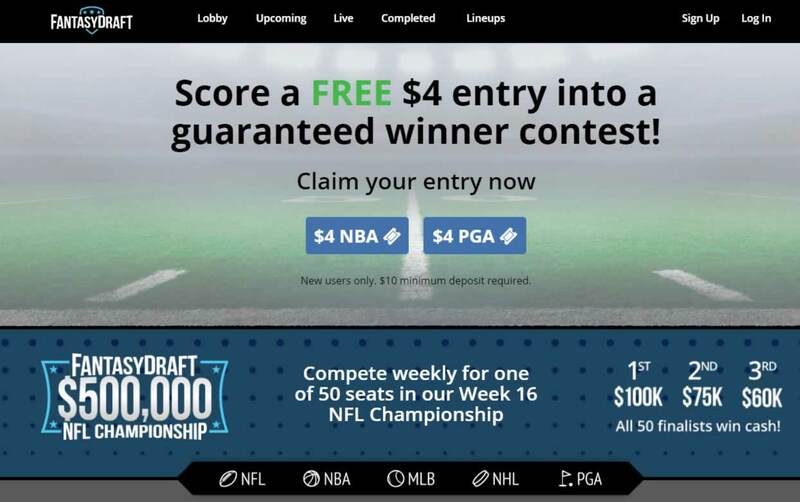 This is a pretty common / straightforward set of contests and sports for the DFS market. If you have played at other DFS sites then this is a no-brainer. Potential players are on the left hand side sorted by position. Once you add them to your lineup they move over to the right hand side on your team. Your salary cap and average per player left updates as players are added or removed from your team. Once you have all players and positions filled you click ‘enter this lineup’ and one more screen to confirm your selection. Then your balance is deducted from your wallet and you are in the tournament. FantasyDraft is a quality choice for DFS players looking for somewhere less crowded than the big two sites (FanDuel and DraftKings). They offer new players a quality fantasy site, 100% deposit bonus and a reputation of fast payouts. I am playing myself in some of the NFL contests this year. The big entry contests have about 4500 seats total. Buy-in’s range from $1 up to $50 in the tourneys I’m looking at. Most contests with less than a $10 buy-in have a few thousand entries available total. This is considerably less than the big two sites. It gives those of us who want to try something different a great opportunity to do so. Here’s what they believe at FantasyDraft. Get in the game! 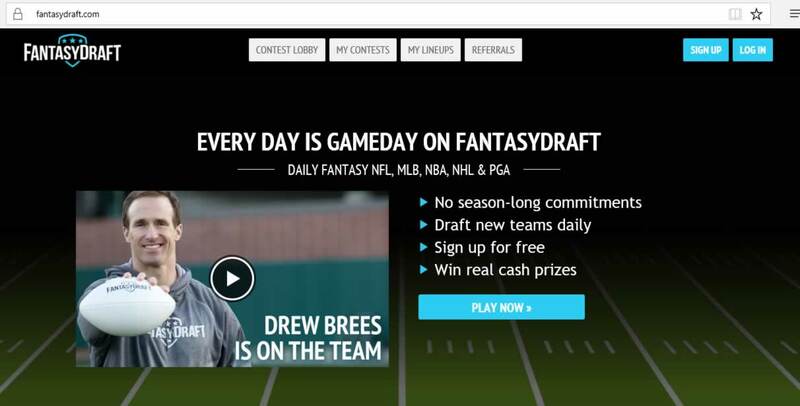 Visit FantasyDraft.com for our top rated smaller sized DFS site!